Sometimes when I receive a request for a single of the Week, the requester often asks for a specific version of the song and if I know it to be a cover version I do wonder that they were aware of an original. This week Kato asked for Giddy Up A Ding Dong by The Sensational Alex Harvey Band who recorded their version in 1973, but the original is from some 16 years earlier. The song was written in 1953 by Freddie Bell who was born Ferdinando Dominick Bello in Philadelphia, Pennsylvania to Italian American parents, and his friend Joey Lattanzi. It was not recorded until three years later after the group had signed to Mercury. 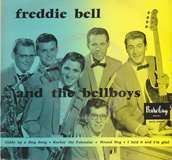 He formed his backing group, The Bell Boys the year previous who comprised guitarist Frankie Brent, Jerry Mayo on trumpet, Jack Kane on saxophone, Russ Conti on piano and Louis Joseph Cicchini on drums. Giddy-Up-A-Dong-Dong was a novelty song designed to showcase the band’s clowning. They were spotted by film producer Sam Katzman who offered them a part in Rock Around the Clock and Giddy-Up-A-Ding Dong became their first Mercury release and was featured in the movie. The song opens with the lyrics, ‘I went ridin’ the other night, two colour horse, oh my what a sight! The name of my horse was Ding Dong while we was ridin’ and singin’ a song’ The nursery rhyme like song continues with ‘We rode and we rode the whole night through, my horse was tired, I was too. I had a date with ma girl at eight, come on Ding Dong we can’t be late’ yes despite its childish lyrics, songs of the time, including Bill Haley’s See You Later Alligator and Tommy Steele’s Rock With the Caveman heralded important social change that meant teenage life would never be the same again. They were a class act live as seen in Rock Around the Clock. The Bell Boys dance in line and their long, skinny pianist, Russ Conti, plays the piano one-handed while dancing for the camera. Kane plays two saxophones at once and Bell in between singing plays trombone during the instrumental break. The Sensational Alex Harvey Band were essentially a glam rock band formed by frontman Alex in 1972. They recorded both original material as well as array of cover versions. Their debut album, Framed, featured the title track, a cover of an old Robins song and an extended six and a half minute version of I Just Want to Make Love to You. Next came Next, a seven-track album with five original songs and their faithful cover of Giddy Up a Ding Dong (without the hyphens). Alex left in 1976 and the band continued without him. He died of heart failure on 4 February 1982. Sadly no original members of the Bell Boys are alive; Conti died in 1992, Brent in 2002, Bell in 2008 and Mayo in 2011. Alcohol takes the blame for many things in this world and often quite rightly so. In this week’s choice for Single of the Week, it takes the blame twice in a good way and not such a good way. When Jerry Lee Lewis first came to the UK in 1958, he was accompanied by his 13-year old wife Myra who was also his cousin. Thanks to one journalist who was waiting for him at London Airport (now Heathrow) he made the fact that she was 13 and his cousin public which completed halted his career and his tour was cancelled after just three dates. He returned to the States and what was seemingly ok before he left was not all right now. Radio stations stopped playing his music and people he knew and trusted abandoned him. He still had a recording contact with Sun record and so kept on churning out songs. That contract ceased in 1960 and Jerry moved to Smash Records but it did little for his career. In the late sixties, his producer, Jerry Kennedy, thought a change of direction could be needed and suggested he record some country and western songs which he agreed to do. The first was Another Place, Another Time which surprised everyone when it flew up the country chart. In the 19th century a lot of Polish and German immigrants moved to Wisconsin and set up a number of breweries which included Pabst, Blatz, Miller and Schlitz. The latter was the one came up with the slogan ‘The beer that made Milwaukee famous’. Sutton, knowing he had to get the song finished now he had committed, worked through the night and by dawn What’s Made Milwaukee Famous with the added twist (Has Made a Loser Out of Me) was finished. The story of the song is a sad one because the narrator prefers a drink instead of going home to his waiting woman. The song starts with, ‘It’s late and she’s waiting and I know I should go home, but every time I start to leave they play another song then someone buys another round’ which says it all. She tells him the relationship cannot survive if he spends so many hours in the pub, which he knows but is unable to help himself. In the end he concedes, ‘Now’s she’s gone and I’m to blame, too late I finally see What’s made Milwaukee famous has made a loser out of me’. When Jerry Lee heard it, it appealed to his instinct and cut it the next day. When released it peaked at number 94 in the Billboard chart. 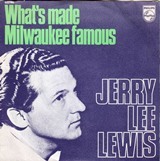 The song was also covered by Sutton’s then-wife Lynn Anderson (Sutton produced her sole UK hit Rose Garden) and with much more success by Rod Stewart who, with a slightly retitled What Made Milwaukee Famous with the added (Has Made a Loser Out of Me), took it to number four in the UK as part of a double A-side with a cover of Jimi Hendrix’s Angel. Interestingly, in 2006, Rod and Jerry recorded a duet version of the song which appeared on Jerry Lee’s album Last Man Standing. In April 2007, Sutton had a heart attack and died in his sleep at the age of 69. He was loved by many and as Michael McCall wrote in the Nashville Scene, at his funeral, and at a memorial service hosted by his daughter Lisa Sutton his friends and family—including two ex-wives and a former live-in girlfriend—told ribald stories of his exploits anchored by loving stories of his generosity, kindness and sweet spirit. What Made Milwaukee Famous was not only Schlitz beer, but a Glenn Sutton song too. One thing I personally never do is read reviews whether it be a film, book or a song. I have no interest in knowing someone else’s, usually a so-called ‘expert’, opinion. If I’m interested I’ll find out for myself. This week’s choice is one of those cult classics which crops up from time to time on half-decent radio stations and is if often recognised, but not remembered by its title. 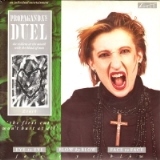 When Duel was released in 1985 it got a slating in Record Mirror’s singles review section, which that particular week was done by the members of more or less forgotten eighties band Scritti Politti. Green (lead singer) said, “They look complete and utter wankers in their photos. I think the whole thing is pointless and horrible. It’s not exciting, challenging or (sic) beautiful.” David Gamson (keyboard player) thought, “The track sounds very lumpen,” with Fred Maher (drummer) adding, “It’s a female Morrissey, it isn’t what I was expecting. Trevor Horn was clearly busy that week.” Thank God I ignored them back then. Their 1984 debut single, Dr. Mabuse, reached number seven in their homeland and number 27 in the UK. They then relocated to the UK and signed a deal with Trevor Horn’s ZTT record label. Horn had signed their most successful act, Frankie Goes To Hollywood, a year earlier and were still really concentrating on building their career especially after the trouble they had getting Relax off the ground. The track has been used in two sporting contexts, firstly when it is played at the Heart of Midlothian Football Club during home matches and the instrumental section was used as an intro by Australian Television in their sports programme called 7 Sport during their coverage of the Touring Car Championship. Propaganda broke up in 1990 however reformed in 2005 but it was just Susanne Freytag and Michael Mertens. Brücken had two minor solo hits in 1990 and 91 with Absolut(e) and Kiss Like Ether respectively. She still performs solo and in November and December 2018 her and Suzanne Freytag, under the name X-Propaganda, supported Heaven 17 on their mini tour celebrating the 35th anniversary of their Luxury Gap album. Who are the most successful duo in American pop history? Simon and Garfunkel? The Everly Brothers? Well, they both were once (at different times) until they were overtaken in the late eighties by Daryl Hall & John Oates as certified by Billboard magazine. This week it’s the story of their third, of six, American number one hits. The pair met in 1967 by accident. They were fronting their own separate bands, Daryl Hall, who was born Daryl Hohl, was the lead singer with The Temptones and John Oates fronted The Masters and were both appearing at the Adelphi Ballroom in Philadelphia which was Daryl’s home state of Pennsylvania, while Oates had travelled from neighbouring state New York. That evening was a band contest with many taking part and at one point trouble broke out between two other bands and gunfire was heard, so everyone tried to escape. Both Hall and Oates got into the same lift and found they had mutual interests and attended the same University so they struck up a friendship. They later shared a few apartments around the state capital. One of their properties had a letterbox which was labelled Hall & Oates and that would eventually become their professional name once with got their musical partnership going. They began that partnership in 1972 and their first album Whole Oats went nowhere. The following year they released what would eventually become their most memorable album, Abandoned Luncheonette, but it did very little at the time. The single, She’s Gone, from that album was only released in 1976 after two or three acts had already covered it. Four year had passed until the UK heard any more from the duo, even though they’d released six album in the States. They signed a new deal with RCA records and returned with Voices which contained the hit singles Kiss on my List and their original version of the Paul Young hit Everytime You Go Away. Next came Private Eyes which contained the first UK top 10 hit, I Can’t Go for That (No Can Do) and this week’s suggestion – the title track. Montreal-born musician Warren Pash was trying to make a career as a songwriter in Los Angeles. He had written a song called I Need You to Need Me, but wasn’t happy with the title. One day he was driving on Ventura Boulevard when he saw an advertising poster for a new film called The Private Eyes which was about two bumbling detectives, that title appealed to him so he went home and wrote some more of the song then retitled it Private Eyes. Pash, a few months earlier, had met Hall and his long-term girlfriend Sara Allen. Hall used to write songs with Allen’s sister Janna who was also a singer. Daryl and Janna had written Kiss on My List which was originally going to be for Janna’s debut album, but it ended up on Hall and Oates’ instead. 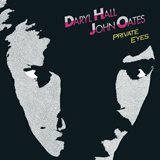 Janna called Pash to see if he had any songs for her album which is when he mentioned Private Eyes. Janna like the sound of it and returned to L.A to work with Pash on it and they finished the song together. When she brought it back to New York to play it to Daryl, Sara added some bits and the song was then credited with four writers. The song tells a story in a similar way that detectives would work, the opening line ‘I see you, you see me’ which indicates the moment when they spot each other after casing a joint. Lines like ‘when it’s watching for lies you can’t escape my Private Eyes’ give the song that eerie feel. The accompanying video was done in the same way resembling an episode of Columbo with the stereotypical raincoats and hat. The video was done cheaply by a film director called Jay Dubin who was known for making cheap videos quickly. The song was used in the 2002 film Cherish and again in 2010 in Knight and Day which starred Tom Cruise and Cameron Diaz. 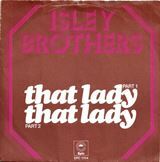 Trivia question: what do, Could It Be Magic by Barry Manilow, It’s All In The Game by Tommy Edwards, No One Is To Blame by Howard Jones and, this week’s suggestion, That Lady by the Isley Brothers? Well among a few others, they were all recorded by those acts without success and then at a later stage re-recorded and became successful. The band were formed in 1959 initially as a trio consisting of brothers Ronald, O’Kelly, and Rudolph and signed a deal with RCA Records, their debut album that year was called Shout! Five years later Lulu opened her UK chart account with a much raunchier cover and ade the song her own. They signed a deal with Motown where their UK hits, in the sixties, included, Twist and Shout, This Old Heart of Mine (Is Weak for You) and Behind a Painted Smile. They added a couple more brothers, Ernie and Marvin, and keyboard player Chris Jasper who had grown up in the same apartment block as the brothers and whose sister, Elaine, married Rudolph. They split from Motown in 1968 and signed a distribution deal with Buddah records and recorded the song It’s Your Thing which was issued on T-Neck records (Major Minor in the UK) and became their most successful song reaching number two in the US and number 30 in the UK. Then Motown issued a writ against the brothers claiming they had broken their contract which the brothers disagreed with. It took until 1975 for the court to decide and found in favour of the brothers. In the seventies, after a four year absence, they returned with another new record contract, this time to Epic, and a song called That Lady. It was an old song originally entitled Who’s That Lady and appeared on the B-side of a 1964 American single called My Little Girl. On the Isley Brothers: Summer Breeze Greatest Hits Live DVD Ernie explained, “This song was originally done as a Cha-Cha/Bossa Nova. Ernie originally did not want to re-record it because he felt that it already had been done. Ronald convinced him it would be worthwhile, as they were going to change the melody, tempo, and lyrics and that it would showcase the guitar work of younger brother Ernie, who had become an excellent player.” Ernie was a fan of Jimi Hendrix and had studied what he did. Hendrix, before he was famous, had played with the Isley’s on a number of their early tracks. Ernie’s extended guitar solo was run thorough a fuzz box and a phase shifter which gave the band a new and distinctive sound. He recalled how he felt after the recording, “When I finished the solo on That Lady, O’Kelly looked at me for 15 minutes straight without blinking. I felt like I had one foot on the ground, one on Mount Olympus. When I hit the first note the song went from, like, black and white to 3D technology. None of us expected that to happen. It changed everything. I lost it, the engineers lost it; everyone else was kind of mummified,” he told Jon Langmead. The new version was officially renamed That Lady and was featured on their forthcoming album 3+3. Although Ernie and Marvin had become members of the band they were still attending college in Long Island and made them very popular with the girls. The intro guitar solo was sampled by the Beastie Boys for A Year and a Day and again in 2014 by Kendrick Lamar who turned up at Ron Isley’s home to ask if could sample it on his new single I to which Ron agreed. The song was also covered by Carlos Santana on his 1990 album Spirits Dancing in the Flesh. Most of us could name a handful of one-hit-wonders, but can you name a five-one-hit-wonder? No, that is not a spelling error, it’s true, there is one person who has fronted five different acts who have all had one UK hit single and that man is Tony Burrows. Burrows began his career in the 1960s as a member of The Kestrels which also included Roger’s Cook and Greenaway who, as you’ll know went on to form a legendary song writing partnership and wrote dozens of hits for a myriad artists as well as a couple of hits of their own as David and Jonathan. The Kestrels did chart any songs but they did, however, tour with a Beatles and were once a backing band for Benny Hill. He then joined the Ivy League replacing original members John Carter and Ken Lewis who had left to form the Flowerpot Men. They wrote the song Let’s Go to San Francisco and called upon Burrows to perform vocal duties. First Class, as a group, never existed. They were yet another bunch of session musicians assembled for the sole purpose of recording Beach Baby. John Carter, who wrote the song with his wife Jill at their home in East Sheen, always preferred writing and production than touring and performing and Tony being the same it was an odd but good combination. It’s just shame they didn’t have a regular group they could write songs for who would then record them and tour. Having said that, neither have done badly. Burrows also did some TV commercials, the most memorable one being the Coca Cola advert. Susan Shirley had recorded a song called True Love and Apple Pie which was written by Roger’s Cook and Greenaway, who reused the tune for I’d Like To Teach The World To Sing. Burrows sang it in the ad and the New Seekers recorded it for a number one hit. He also did ads for Rowntree and Vauxhall. On top of that, he has sung backing vocals for Elton John, James Last, Tom Jones and Rod Stewart. In the nineties, Carter set up his own Sunny record label for the purpose of marketing all his back catalogue. He and Jill currently run their own publishing company. Additionally, in 2012, he teamed up with a Brazilian musician, Salomao Hamzem, and have released three albums, A Friend in Need (2016), Coming Home (2017) and Time Will Tell, in 2018. 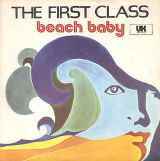 Tony is probably the most successful one-hit-wonder, five times and Beach Baby is certainly the best song the Beach Boys never recorded.